President Trump is tweeting insults at Arnold Schwarzenegger and tweeting claims that President Obama had Trump Tower wiretapped during last year’s presidential campaign … say what? The president is showing his alternative facts again. Let’s agree Trump’s argument with the former California Governor (Schwarzenegger) is trivial. Who really cares if Arnold quit or was fired? Who, besides NBC, cares whether The Celebrity Apprentice stays on the air or not? It is another example of the low information president spending time on things other presidents ignored when there are so many other important issues at hand. 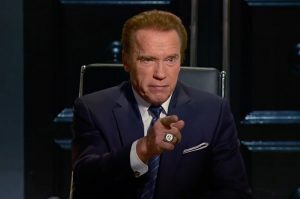 Actor and former California Governor Arnold Schwarzenegger will no longer be telling people they are fired on The Apprentice. Cites nuttiness of Executive Producer Donald Trump as one reason. What Americans should be asking is: What did President Trump know and when did he know it? Now, after Trump’s former campaign manager Paul Manafort and retired Gen. Michael Flynn had to resign for speaking to the Russian officials during and just after the campaign (Flynn spoke to the Russian ambassador in December) and Attorney General Jeff Sessions had to recuse himself from any investigations into President Trump or his aides, before during and after the campaign (post-election), it’s becoming clear President Trump and his team are at least as crooked as President Nixon, some 45 years ago. His top aide and son-in-law Jared Kushner has now been ensnared in this investigation. Former aids J.D. Gordon and Carter Page met with Russian Ambassador Sergey Kislyak during the Republican National Convention, as did Attorney General Sessions. It’s been confirmed in reports leaked to the press that the intelligence agencies knew Trump campaign advisors were meeting with Russians — including Russian intelligence agents, although to be fair, as Paul Manafort said the agents don’t wear badges declaring they are with Russian intelligence — so would it be fair to assume that they were talking about the Trump campaign and possible promises if Trump actually won the election? What else would they talk about? But, the attorney general claims his visits with the Russian ambassador were in the realm of his duties as senator from the great state of Alabama — which could also include discussions about Crimea, Ukraine, and U.S. sanctions. What would have been on the Russian ambassador’s mind (and the mind of his boss Vladimir Putin) last year? Could it have been the sanctions against Russia for invading Crimea and the eastern portion of Ukraine? Could it have been the oil deals with Rex Tillerson’s Exxon-Mobil that were quashed by the sanctions? And maybe in December the sanctions that were imposed once it was revealed Russia had indeed hacked the email servers of the DNC and John Podesta? What Trump loyalists want us to believe is that Putin changing his mind about retaliating was just a coincidence — even though those two events took place within hours of one another. This is the biggest issue facing Americans today: how compromised is the executive branch of government? The biggest issue should be global warming and Trump’s plans to expedite the construction of the Keystone and Dakota Access pipelines. A pipeline spill just occurred 150 miles from Cannonball, North Dakota, site of the Dakota Access demonstrations. Or maybe the top issue facing Americans should be race relations. That’s been a growing issue for over 500 years. There are a lot of issues we Americans should focus on, from the climate to race relations, to jobs and the economy, but we have this issue with the Trump Campaign having contact with the Russians during the campaign while Russia was meddling in our election. Where did the president get this information? Breitbart News and right wing nutcase talk show host Mark Levin of course. Levin unveiled his conspiracy theory Thursday evening and then Breitbart posted it on their website. As a result the pundits and some members of Congress are getting hyper about the possibility President Obama had Trump Tower wiretapped. Everyone connected in any way to the intelligence community has rebutted Trump’s claim and the director of the F.B.I., James Comey, has asked the Department of Justice to issue a statement saying the president’s claim is false and needed to be corrected. So far the DoJ has not issued any such statement and the Trump Administration is doubling down on it. In the short term President Trump’s latest lie takes some of the focus off the very real issue of his aids speaking to Russians during the campaign. But in the long run, if Congress decides to investigate who was being wiretapped and why, they might find out things the Trump Administration doesn’t want made public. Apparently it is okay for intelligence agencies to wiretap foreign nationals, especially if they have ties to foreign governments, like Putin’s Russia. But if an American is on the other end of a phone call with one of these foreigners, the agents are required to hang up the call. But, if they have a warrant for that American, from either a conventional court or a FISA court (Foreign Intelligence Surveillance Act), they can continue listening. That would be the only way the F.B.I. or any other intelligence agency could listen to Michael Flynn talking to the Russian ambassador. Why would the F.B.I. have a warrant on Flynn? Are there any other Trump associates that are under electronic surveillance? No, it’s too early to call for President Trump to be impeached, but an independent, special prosecutor needs to be convened to investigate the full scope of Russiagate. No amount of “alternative facts” will erase reality.